It's nearing the end of January and what feels like the longest month of the year. We all set resolutions on the 1st of January. We vowed to lose weight, to exercise more. We promised our wives we'd be home for dinner, and we told ourselves we'd all learn to chill out a bit more. However, after the longest and the most financially struggling month of the year, February and the end of resolution is looking ever more tempting. Stop yourself there though, as we have the perfect class or course for you to take, to make sure your resolution stays on track and there are no slip-ups, come February. Eating healthy is the worst. From overpriced and underwhelming salads to falsely advertised 'healthy sandwiches,' our lunch options are bleak in London when it comes to nutrition. Obby has recently teamed up with Kitchen Joy. Joy turned to alternative medicine when her daughter fell ill, and no one could diagnose her. She eventually found out that her daughter, allergic to aspartame, was reacting to all the processed food she was eating. Kitchen Joy runs several cooking classes, on how to eat 'real food'; food without additives, and unheard of ingredients, this is taking cooking to a new level. Food can be the cure for a lot of things, from a bad mood, or illness and Joy take you step by step through recipes that will undoubtedly make you feel fabulous. If your new year's resolution was to take into account the things that matter most to you. Was it to spend more time with your loved ones? Do you need to focus more time on yourself? Are you letting your personal life distract your career goals? Life throws so much information at us; it is difficult to focus on what is important to us, difficult to even realise what we find important. Supposedly we take in the equivalent of 174 newspapers worth of information daily. That's a lot of distraction if we are trying to focus on a certain thing. Meditation is the learning of being able to objectively observe emotions as they enter your life and control your reactions to them. It works in a way to let you control and process the information you choose to take in. On Obby we are introducing the art of modern meditation. Specifically tailored and mastered by people who have struggled with a modern lifestyle, and know exactly what works to help quiet your mind. Louise used to work in the city at a huge charity and started meditation when she realised she had lost focus on what was important, making this the perfect course for someone who is struggling with the same issues. Crafting has well and truly has a modern makeover. With more turning their backs on alcohol, and the millennial generation investing in experiences rather than material objects, crafting and creative events have surged in popularity. Immersing yourself in a creative task has various benefits, but being something different to do with friends, or just alone, is an added bonus. 70% of our Obby customers book onto experiences alone and attend by themselves, as a chance to meet new people. Find yourself a new passion project, meet someone with the same interests, it all starts with taking the first step. Sea Glass has been naturally tumbled in the ebbs and flows of the sea waves before being washed upon the shoreline for a lucky beachcomber with a keen eye to collect these timeless treasures. 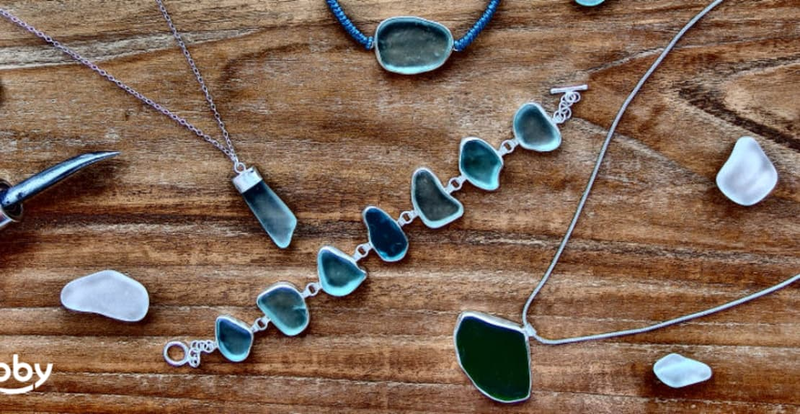 Each piece of sea glass is completely unique, so why not create something entirely your own, with a creation of Mother Nature herself. This course, making jewellery with natural sea glass gives you a chance to coombe through a selection of gems and find one that catches your eye and your heart. Set your chosen gems in fine silver before fabricating them into your own pendants or bracelets.